You might remember the God's Eye scrap quilt top I just finished. Well, even I was amazed that after finishing that top, I *STILL* had a lot of 2" strips left over. I remembered an interesting layout that Denise (TeddyBear Phx/CA Teddy Bear on About.com's Quilting Forum) did at one of the AZ Retreats ... it was a Twist-n-Turn block. So, I used Electric Quilt to make the block ... and then I had a template for the block and the triangles. I know this wasn't how Denise originally did it, but in the end, it worked out well for me. The triangles on the sides are done in two fabrics (one color top/bottom, one color for the sides), so that when the blocks are sewn together, a very interesting star secondary pattern emerges. It's important to know this because you can easily overpower the center square if you choose a bright color for the triangles. My central square was, once again, a scrap strip block sewn on a fabric foundation. Once again, I used garment lining/underlining fabric for the foundation, simply because I had it on hand and certainly wasn't going to be using it elsewhere. I wanted the strip squares to be the focal point so was in somewhat of a quandry over what colors to use for the triangles, as the resultant stars needed to be subdued. Black was an obvious choice but I needed a second color also. Any real "color" tended to overpower the scrap portion so I eventually settled on a medium gray. I'm not sure I'm entirely pleased with the outcome; it doesn't thrill me as much as I thought it might; it isn't nearly as dramatic looking as the God's Eye quilt that also used black. And since I was becoming somewhat disillusioned during the construction process, I realized I was losing interest in even finishing the top. However, I perservered and the top got done. It does aptly demonstrate that even quilters of long-standing have funks that need to be worked through. It did serve the purpose of using up more of my scrap strips in a useful manner. And it was a non-stressful top to practice my longarm quilting on. The quilting design is a pantograph by Hari Walner called "Children 1" and is one of three pantographs on the roll. I chose to do the bunnies holding hearts and used a variegated gray-to-black thread, which didn't show up so well on the front since the front is so busy. I wasn't too worried about that, as I just wanted more practice with pantographs. 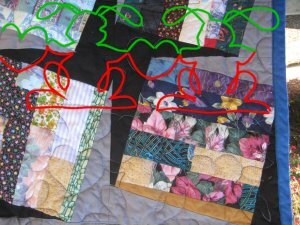 In the picture to the left, you'll see the quilting design is in two colors: the green is the top half of the design and is the first pass of the pantograph; the red line is the bottom half of the design and is done on the second pass. You can see the quilting better on the back of the quilt. However, it's "good enough" as a utility quilt. Interesting observation on my part: one thought that was rattling through my brain as I was sewing the strips together was that I might donate this to the local charity that I support. But, as with the God's Eye quilt, as I was handling the strips, I could remember when and where I used that original fabric. These two quilts are actually memory quilts, aren't they? 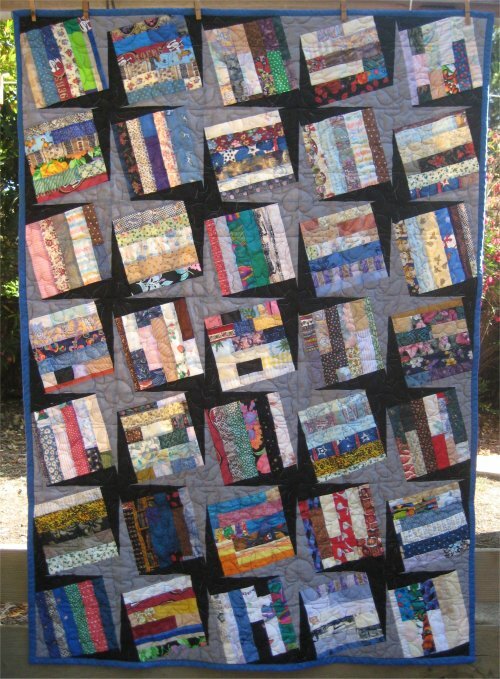 I find myself very reluctant now to give the quilt away, eventhough it's not particularly pretty. However, when the quilting was done, I had reconciled myself that I *did* have the God's Eye quilt and some child might actually need this one. During the construction, I actually used two new pressing techniques for me. 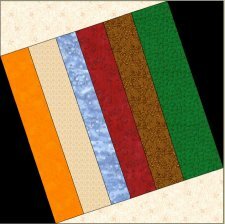 1) During one of Alex Anderson's "Simply Quilts" episodes, she and the guest were commenting that, although it's been hammered into us to press seam allowances to the dark fabric, it really doesn't matter whether you do or not. Alex says she presses seam allowances where they want to go ... she follows the natural inclination of the fabric to go to one side or the other. On another episode, the guest was talking about her hand applique technique. I wasn't paying too much attention until Alex made a point of interrupting the guest to have her repeat what she just said ... it was that important. So, I paid attention. The applique shape was a "ying-yang' sort of design. Normally, in applique when one shape is under another, you don't need to turn that seam edge because the shape on top will cover the raw edge. BUT, with the ying-yang nestled shaped, both shapes are simultaneously on top AND under each other. The guest solved this problem by *clipping* the seam allowances of both shapes at the mid-point, which allowed both shapes to overlap each other properly. This was a revelation. So, when I was pressing the Twist-n-Turn blocks, I discovered that the weight of the pieced block wanted to force the seam allowance towards the triangles but if left that way for the entire seam, the seams at the intersections would be horribly bulky *and* the seam allowance would be turned in the "wrong" direction for the adjacent block. So, at the mid-point of each block, I clipped the seam allowance. In the picture, please notice that the white foundation block has its seam allowance pressed down, towards the black triangle. That's where the weight of the strip pieced square wants to go. But, if I pressed the entire seam allowance down, the pink foundation block would be pressed back onto itself and be very bulky. The weight of the pink foundation block wants to go *up*, towards the gray triangle. To enable the seam to be pressed in both directions, a clip was done midway between the two foundation squares. It could be that the seam allowance might be weaker at the clip BUT in garment sewing, armhole curves are clipped all the time and they are still pretty doggone strong. So, I'm not terribly worried about the seam becoming undone, either now or when the top is quilted. 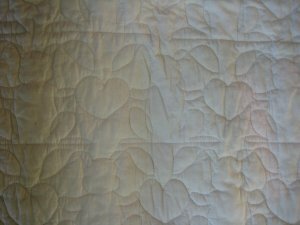 Quilt seams just don't get the same amount of stress that sleeves & armholes get and if garments can withstand the curves being clipped, then quilt seams will also. then, the second technique: 2) the seam intersections. Normally, I press them one way or the other, but I press ALL the seam allowances. You know what I mean when I say there can be a lump at the intersections. Well, Alex had a tip for this problem too. She was talking about 4-patch blocks, but it actually applies to all seams. You spread the seam intersection is such a way so that it kinda "spirals" like a flower petal. On the wrong side, the intersection looks like a miniature 4-patch ... and is COMPLETELY flat. I re-ran that segment a couple of times before I saw what she was doing. So, on all the seam intersections for this quilt, I did this "spiral" thing (I haven't a clue if there is a real name for this technique) and, indeed, those intersections are doggone flat. I love it. 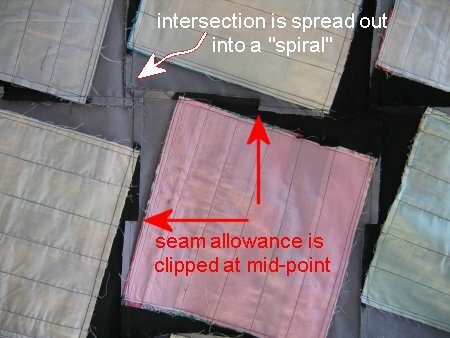 :-) The picture that shows the clipped seam allowances also shows this intersection technique. This top now joins the other unquilted tops, to await its turn to be quilted.